I’ve eaten a lot of tacos in my life and one of my favourites, hands down, are tacos al pastor. 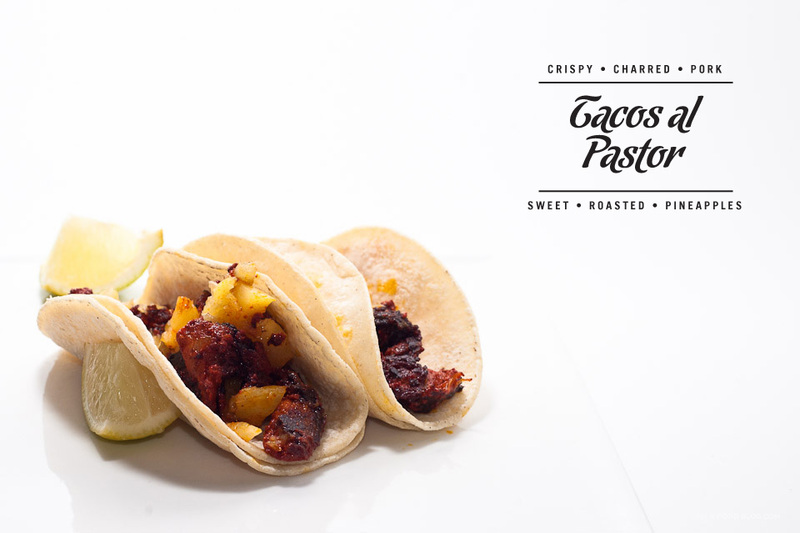 The combination of crispy charred pork and sweet roasted pineapples in a warmed corn tortilla can’t be beat. Unfortunately you can’t really do traditional tacos al pastor at home, but that hasn’t stopped me from trying. Al pastor are the Mexican take on kebabs–they’re grilled in a similar fashion on a twirling kebab spit. A giant cone of pork is roasted with a vertical boiler. The pork is sliced to order-usually, you’ll get a mix of the charred, crispy bits and the tender insides. 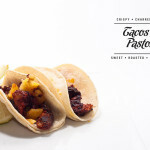 After the pork is sliced, they’ll do a bit of fancy knife work and slice off a piece of roasted pineapple, fling it through the air and catch it on your taco. Most people don’t have a vertical broiler at home, but with a bit of specialty shopping, you too can create a tasty version of tacos al pastor–no pineapple flinging skills needed. I am pork-y, I am pineapple-topped: I am Tacos al Pastor! 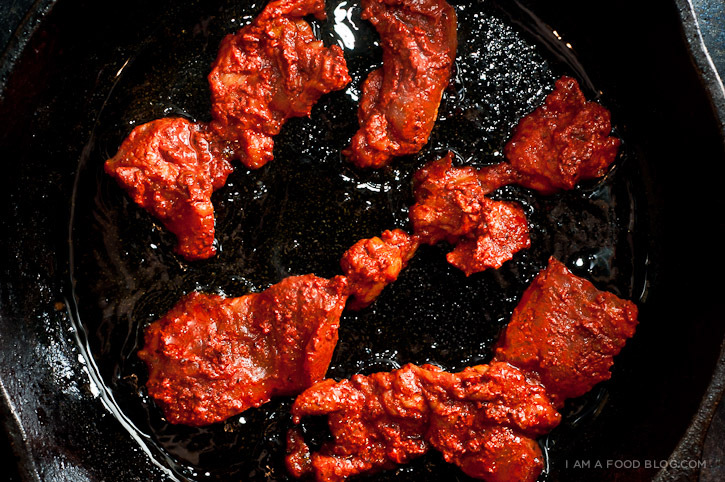 In a blender, combine the achiote paste, chilies, canning sauce, oil and 3/4 cups water. Blend until smooth. Marinate the pork slices for at least an hour. Heat a cast iron skillet with a touch of oil over medium high heat. Grill meat slices in batches until slightly charred and cooked, about a minute a side, moving slices as needed. Remove and keep warm. Grill the pineapple in the same pan over medium heat, until lightly browned. 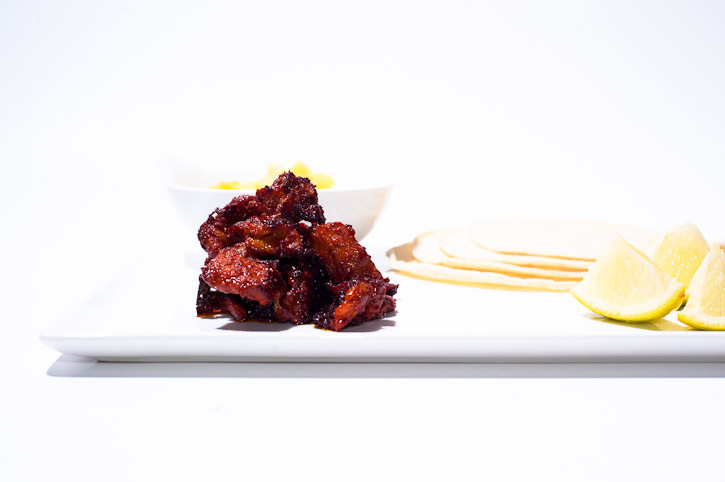 Enjoy the pork and pineapples with the warmed tortillas. Top with onions and cilantro to taste. i live in mexico city and have tacos al pastor on every corner and i will still make them at home with this recipe! you rock. I like either La Taqueria or Salsa and Agave. You can get mini corn tortillas at El Comal in Burnaby if you want to give street tacos a try at home! Simply stunning post. 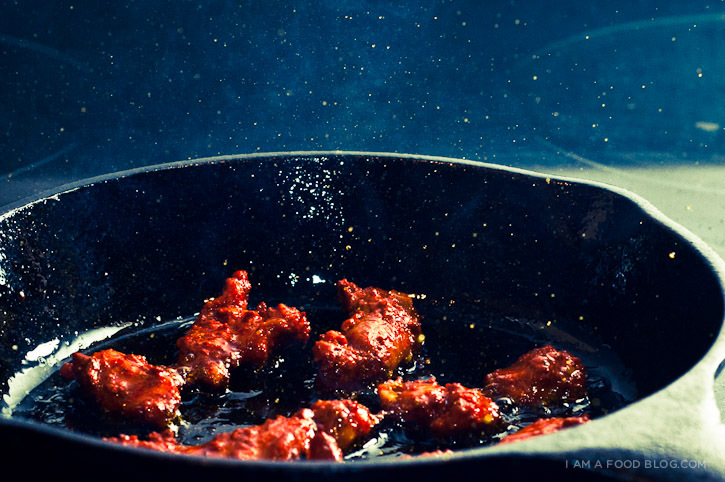 We have been trying to experiment with cooking al pastor at home, but haven’t had a ton of success. Any ideas where I can import a trompo? Also, I’m adding your blog to my blogroll! Fell in love with the street version in Cozumel at Los Seras on 30th Just had them twice this past week and now that I’m home was glad for your recipe. Can’t wait to try it. The canning sauce is just the sauce in the can from the canned chipotles. What would you suggest as a replacement if we can’t get pork shoulder? hi, i already wrote on your carne asada recipe about how great this blog is. i just wanted to add that this recipe is fantastic as well. so good. also, i probably have a taco problem. i’m just now realizing this. My favorite holiday memory would be going to my Granparents house in Mississippi. My Grandma always made the best Lace Cookies!